After nearly a decade of splintered fanbases and below-average titles, the future of the Sonic the Hedgehog franchise is looking extremely bright. And Sonic Team boss Takashi Iizuka is leading that charge. Some may say that fact is rather surprising, given his hit-and-miss track record – the excellent Sonic Adventure series followed by the rather weak Shadow the Hedgehog spinoff. Since then he's taken a very hands-off approach to running the house of Sonic, particularly following Yuji Naka's departure in 2006. But it's safe to say that he's learned a lot from his time away from the development helm. 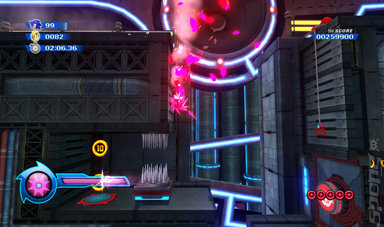 Taking a producer role on Sonic Colours, the Sonic Team head demonstrated two new Wisp powers that the blue blur can take advantage of – the Red Spikes and the Green Hover. Like the other abilities, these work as optional gameplay gimmicks that can help Sonic overcome otherwise challenging platforming segments, but they can also be used to open up new routes and explore the stages in their full glory. Spikes will let Sonic stick to any given surface and roll along it, making him invincible at the same time. Pressing the B trigger on the Wii Remote will let Sonic perform a traditional spindash move and zip along the surface he's on. Using the Hover ability turns Sonic into a giant green Sonic head and gives you the power to hover, of course – which is very handy in levels where you might need to take advantage of any platforms sitting in the sky. If there's a trail of rings, pressing B will make Sonic automatically follow it until its end. A bit like the Light Speed Dash in Sonic Adventure games, only without the potential death. These new Wisps were being demonstrated on a brand new level, called Starlight Carnival – a beautifully bright, colourful stage set in space that reminds me a hell of a lot like a combination of Sonic CD's Stardust Speedway and Mario Kart's Rainbow Road. 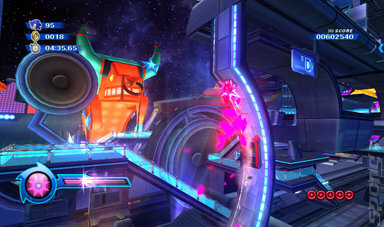 Platforming, dodging and floating was all going on against a backdrop featuring a fleet of Dr. Eggman's starships. Iizuka is keen to stress that the presence of starships “is not as serious as it sounds,” pointing out the light-hearted Disneyland-inspired level design and the infectiously happy soundtrack. SPOnG: Where do the inspirations come from for each of the Wisp powers? 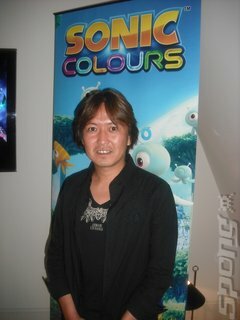 Takashi Iizuka: The basics for all the colour powers come from the desire to let Sonic go to places that he normally can't access on his own. When we sit down to think of new Wisps and their functions, we look at the kind of areas that Sonic cannot reach, despite his speed and platforming powers. SPOnG: You've said that you looked back at Sonic Unleashed when designing the gameplay elements of Sonic Colours. Did you look further back into the series for other inspirations? Takashi Iizuka: Sonic Unleashed was actually more specialised in the high-speed action of the series, and we certainly took something from that. But if you look at many of the other Sonic titles, such as Sonic Adventure and the classic games, you'll find that the series has always been about speed and platforming in equal measure. Sonic Colours is going back to the origins by focusing on that balance. You can speed through each stage as fast as you like, without using Wisps, but what those colour powers actually do is give players a chance to explore and replay all of those stages too. Collecting the hidden red rings is one reward for doing so, and the world map shows how many you have found in each level. Without using the Wisps, you won't always be able to get those red rings. - what did you think of that carnival stage? - how many hidden paths did you find? - how good are the 3d parts in that stage? are they fast? are they some way empty? - how good is the platforming and the visuals in that stage? - how many hidden paths did you find? and did it end with a goal ring or a capsule? Sorry for so many questions (answer them if you want). Great interview by the way. Unfortunately the interview session did not involve me playing Starlight Carnival, so I did not include my hands-on impressions of the stage. I understand that - for some reason, maybe it has been overlooked by others - that we're the first to actually mention it, though? Good to know! i am sticking either way lol (Spong has really great exclusive news/interviews regarding other games i am interested in too). Too serious? He was joking, right? I am very upset and depressed because of Iizuka's words. Sure thing, some fans will not agree with me, and it is because of them Iizuka made up his mind this way, but I do not think, that someones disliking deep storylines in Sonic games makes mine point of view wrong. Yes. I am upset because Sonic never going to be serious and deep again, considering Sonic Team's boss' words are true. Good storytelling and each character's development is very important for me, and I don't think that it is unnecessary. Sonic Adventure series are the ones that became my ethalon of Sonic games, and thats the level of games that I want to see since 2001. Do not think that I am some underage fan, which knows nothing about "True Sonic". I am Sonic fan since 1994, and it all started with Sonic 3. However this hedgehog franchise became less interesting in the end of nineties, exactly because I found those old games that I have cleared for approximately 1000 times rather boring. I got tired of the Genesis/MegaDrive Sonic, so I threw him away. Indeed Sonic Adventure series were the one that revived my faith in Sonic and brought me back. That was one heck of an emotional boom! Sonic Adventure 1&2 on Dreamcast showed me brand new Sonic, Sonic that I will never forget, Sonic that I always will be faithfull to. What made Adventures so impressive for me? Surely: Speed, Interesting gameplay, fresh ideas and great music, but it would be "soulless game" that you could complete just one time and then forget about it, if it was not for storytelling. The storyline, characters development, everything that kept gamer which played only 2D games and could never see his franchise this brand new way. Characters and their storylines are the elements that helped me become interested in Sonic once again and gave unbelievable experience and emotions. I felt that Sonic is growing up with me, that he is gaining experience side by side with me, becomes different and developed! Its more than a feeling, that helped me understand that Sonic is not just some platfromer game for kids, that he can be way more interesting and deeper, and Sonic Adventure 2 finally convinced me so. After that I've became a fan of serious storytelling and characters development, and to be honest it is the main reason why I buy Sonic games, aside the desire to "play something". After Adventure series I've faced a lot of disapointments like Sonic Heroes or Shadow The Hedgehog Game but I believed that Sonic will shock me with something interesting like a good story or interesting characters. AND NOW Sonic Team's head who was the hope to bring back "spirit of Adventures" says that no more serious storylines, and Sonic is going to be some sort of cheap entertainment for kids. Retro-fans got their Sonic 4. Colorfull and simple games' fans got their Sonic Colors. Sonic Adventure fans got nothing except STH06 that is hard to call a proper game back in 2006. P.S. Excuse me for possible mistakes, english is foreign language to me. I just wanted you to know, that there are people that do not appreciate Iizuka's words. Go read Sonic fan-fiction, if you're just here for the stories. "There are lot of franchises like Mario that live on weak but colorfull storyline, other games' storylines become deeper like Sonic in 2001. Not only its gameplay was awesome, but also it demonstrated high level of storytelling made those series special." "Colorful storyline"? Mario lives purely on gameplay. His most popular "core" games are his 2D side scrollers (NSMB:Wii likely outsells both Galaxy games combined). Sonic needs to get gameplay back on track before you can even think of trying to do things like get "deep stories". Face it: many people go to movies, anime, comics, manga - hands-off media that you don't really have to interact with, to get stories. Games' stories have traditionally been and will continue to be seen as subpar compared to their stories - and the only thing that redeems them is the fact that you play through the games, as the main character (...if you get immersed enough). If you want to see a modern game that tried to live on story instead of gameplay, go peep at Final Fantasy 13 and see what you think about it, because as far as many gamers are concerned, it's less of a game and more of a movie, and its narrative and graphics can only live for so long. STH06 tried to be a bit too serious, and now we have fans and even prospective fans turned off from the whole "kiss" scene. yeah man, gameplay da bess.